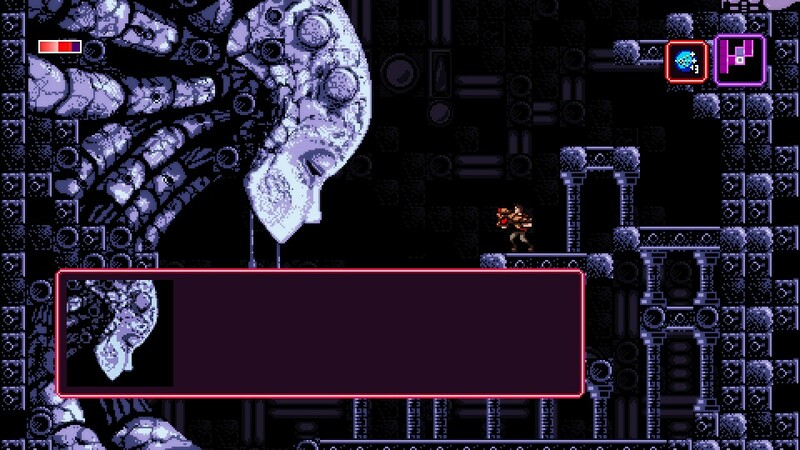 Axiom Verge is a Metroid-style exploration and action side-scroller shooter game released on Steam in 2015 by Thomas Happ Games LLC. The game starts after Trace is the victim of a lab accident, and wakes up in a mysterious alien world with no memory of how he got there. He begins exploring, with the guidance of a mysterious voice in his head that knows more about his situation than he does. As he goes he finds an arsenal of new weapons and items that both help in combat and help unlock new areas of the map that weren’t reachable before. As he explores wider and wider he finds out more about why he is here and what he is meant to do. 16-bit style graphics, nice enough for what they are. Amusing to have glitchy visuals as an intentional visual effect. I didn’t use the audio too much (you can play the game without it which I often will), but the soundtrack is decent, again seems to be inspired by Metroid with its moody soundtrack. The weapon and monster sound effects I thought were kindof annoying, just as well that I usually play muted. One of my favorite aspects of these games is that you will reach a place in the map where you are obstructed because you don’t have the appropriate item to pass an obstacle yet. So you are rewarded if you kindof keep track of what kind of obstacle you saw where because then once you find the item you can head back and find whatever your reward is for passing the obstacle. If you end up dying somewhere, you are reincarnated without losing any progress–any map you explored, any items you collected are retained. I found that reduced the possible frustration, but I suppose it reduced the challenge to some extent as well since there is little penalty for dying. Certainly some story which unrolls bit by bit as you defeat bosses and find some sympathetic entities that need your assistance. It’s fairly light on story, you don’t have to really pay attention to the story to move forward, you just have to keep on exploring and fighting bosses and etc. The story there is is fine, I didn’t find it hugely compelling but I was entertained enough by the game I didn’t care. 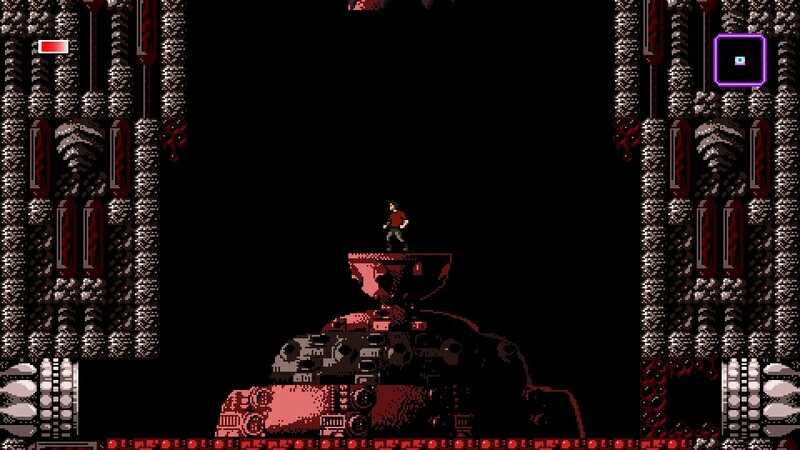 There was one segment of the game where the story really took the forefront, transforming a level into a hallucinogenic nightmare–which both cranked the challenge way up and it was interesting to see what they did with it. Very quick game bootup. You can quit the game at any time and it will save your progress, your map exploration and item acquisition and bosses you’ve defeated and etc, so it’s pretty easy to put down. But the next time you start the game you will still start at the last save point you visited, so it may take you some time to get back to the point on the map you were at. So it’s easy to put down, but you may have to retreat to get exactly back where you were. Pretty standard controls for this kind of game, easy to get used to. You could keep playing to try to find all of the map and all of the items if you’re into that sort of thing. 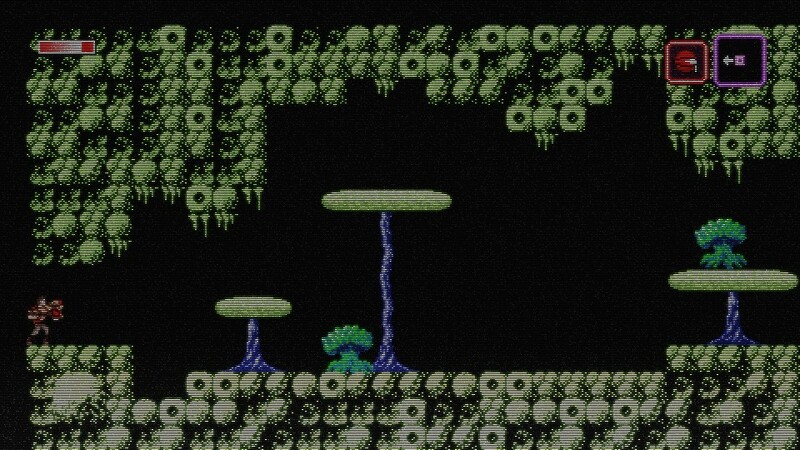 The game is clearly heavily inspired by Metroid, so much of its format it owes to that. I did appreciate that the game designers didn’t just copy everything from Metroid–the weapons are newly designed, the items to get through obstacles and that sort of thing are all original and it’s interesting to see where they’re going. So, very familiar format based on a very well known game, but enough original pieces to make it worth playing. I expect this varies wildly based on how completionist you are about map exploration, how efficient you are at remembering what parts of the map have what kind of obstacle, and how good you are at the action sequences (to require more exploration to beef up your stats). Usually I grab my Steam time on the game for this value, but it is telling me only 3 hours and I know that’s not right–the in-game is telling me more like 12 hours which is probably closer. (But I didn’t try for completionist, I did explore the map as widely as I could as I went but didn’t worry about trying to get every single thing). If you dig Metroid style platformer-shooters you should enjoy this game (and if you don’t know what a Metroid style platformer-shooter, it’s not a bad choice to be the first of its type you’ve played). Action, gradual map exploration as you find items that unlock new areas, fun stuff. $20 on Steam.